The River Warrior Society, Kalispel tribal members, and regional canoe families are hosting the Remember the Water canoe journey again this summer, paddling traditional, wooden canoes 71 miles on Pend Oreille Lake and River, from the Hope peninsula, Idaho, to the Kalispel village north of Usk, Washington [1-3]. Tentatively meeting on Tuesday, July 31, at Sam Owen Campground near Hope, participants will discuss water, wind, and wave temperature and speed and other conditions on the lake. The journey will put-in at Denton Slough on Wednesday, August 1, after prayers and smudging the canoes at 8 am. Approximately nine miles into their first, 20-mile day, paddlers will stop for a lunch break at Trestle Creek. The journey plans to land at City Beach Park in Sandpoint at 3 pm or later on Wednesday afternoon, August 1, although its timing is difficult, having never previously covered this stretch of Lake Pend Oreille. The canoeists welcome everyone and groups like Lake Pend Oreille Waterkeeper and Wild Idaho Rising Tide (WIRT) to greet their arrival and take-out, among possible song and prayer. Please join us for this significant event, and for canoe smudging, prayers, send-off, and re-launch from the City Beach boat ramps, at 8 am on Thursday, August 2. Indigenous and accompanying paddlers will continue downriver 21 miles, from Sandpoint to the next, Thursday night layover on Kalispel tribal lands, at the Carey Creek Game Management Area off Dufort Road, near Priest River, Idaho. The voyage has also scheduled a Friday, August 3, lunch break in the Newport, Washington area, next to the Rotary Park boat launch by the river bridge, in Oldtown, Idaho. The 17-mile, Friday paddle concludes at Downs Island, just upriver of Indian Island, near the Sandy Shores boat launch. On Saturday, August 4, after breakfast, canoe smudges, and prayer at 8 am, the canoe journey will travel 14 miles from Downs Island, breaking at the Usk boat launch under the bridge, and reaching the Kalispel village boat launch and yearly Kalispel Tribe Pow Wow. The destination offers buffalo burgers, camping, and Wellness Center showers. WIRT activists are grateful for the Remember the Water canoe journey, as we resist reckless railroad coal pollution, potential oil spills, and proposed bridge construction in the life-giving waters of Lake Pend Oreille. Please contact River Warrior Society organizer Nathan Piengkham at npiengkham@kalispeltribe.com, for finalized event itineraries. As the sun sets over Sandpoint, Idaho, between 8 and 9 pm on Friday, August 3, Occupy comrades from Spokane, Washington, will graciously offer a brief, light projection display of social and climate justice messages on tall structures around the Festival at Sandpoint. Meet in or near Lakeview Park, wherever you see this light show, for discussions among curious passersby, about #No2ndBridge and Northwest coal and oil train and terminal issues. Unwilling to miss the Friday, July 20, deadline for challenging a state permit, Wild Idaho Rising Tide (WIRT) filed pro se (without attorney representation) a notice of appeal in Idaho’s First District Court, of the Idaho Department of Lands (IDL) encroachment permit granted to Burlington Northern Santa Fe Railway (BNSF) for its proposed rail bridge and track expansion across Lake Pend Oreille and Sandpoint, the “Sandpoint Junction Connector” project [4-9]. 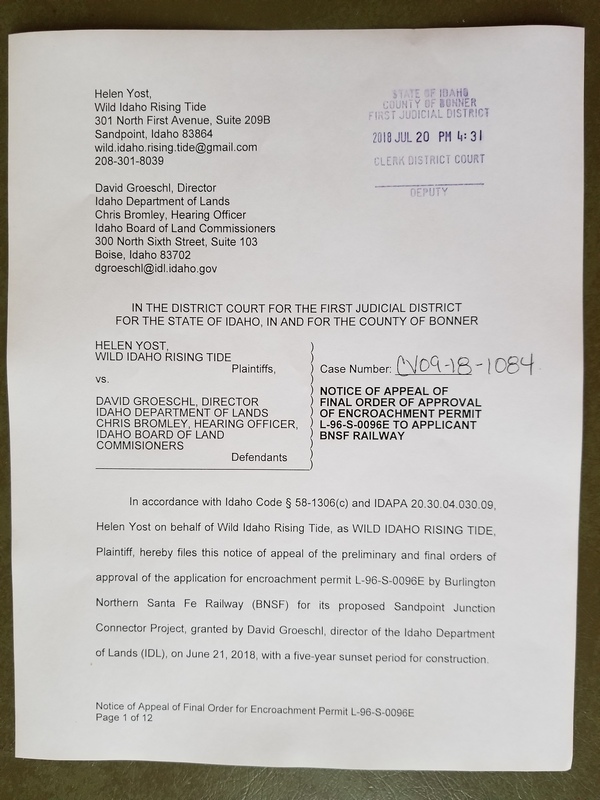 On July 20, 2018, Wild Idaho Rising Tide (WIRT) filed a notice of appeal of the preliminary and final orders approving Burlington Northern Santa Fe Railway’s (BNSF) application for an encroachment permit for its proposed Sandpoint Junction Connector Project. David Groeschl, acting director of the Idaho Department of Lands (IDL) in Boise, granted the five-year encroachment permit on June 21, 2018. BNSF plans to construct 2.2 miles of doubled tracks, two temporary, work spans, and three permanent, parallel bridges adjacent to the existing rail route across Lake Pend Oreille, Sand Creek, Bridge Street, and downtown Sandpoint, Idaho. The appeal challenges several errors of the final order, most notably its failures to uphold the state Lake Protection Act and Rules for the Regulation of Beds, Waters, and Airspace over Navigable Lakes. Both mandate regulators to “give due consideration and weigh…the protection of property, navigation, fish and wildlife habitat, aquatic life, recreation, aesthetic beauty, and water quality” against the economic necessity, justification, or benefit derived from any proposed encroachment on, in, or above navigable lake beds or waters. Although “public health, interest, safety, and welfare require” this balance, WIRT activists argue that Idaho officials inadequately examined and compared these “lake values” with project outcomes, discussing environmental concerns offered by individuals and agencies in only two of 42 pages of their permit decision. The plaintiffs question the legality of sidestepping these stricter state regulations, in deference to an antiquated, U.S., railroad land grant law and hundreds of pro-project, BNSF, form letters from out-of-state commenters. The 1864 act gives railroad companies unusual power to retain exclusive possession and “complete dominion” over their 400-foot-wide, privately owned route “adjacent to and crossing Lake Pend Oreille,” since before 1890 statehood. IDL director Groeschl asserts that his final order must only “recognize BNSF’s right to utilize the right-of-way for construction of a railroad bridge and associated fill,” thus dismissing his obligations to the environmental and economic wellbeing and public trust of the Idaho Panhandle community, in preference for the railroad pursuit of profit. The Wednesday, July 25, 2018 Climate Justice Forum radio program, produced by regional, climate activist collective Wild Idaho Rising Tide, features an interview with Sandra Steingraber, an upstate New York, anti-fossil fuels activist, ecologist, writer, and internationally recognized researcher on the environmental links to cancer. We also share news and reflections on a federal hearing on Idaho forced pooling of private, oil and gas owners, an employment ad for Boise fracking jobs, the second Remember the Water canoe journey by Kalispel tribal members, an appeal of a state permit for Lake Pend Oreille railroad construction, and Washington, oil industry expansion. Broadcast for six years on progressive, volunteer, community station KRFP Radio Free Moscow, every Wednesday between 1:30 and 3 pm Pacific time, on-air at 90.3 FM and online, the show describes continent-wide resistance to fossil fuel projects, the root causes of climate change, thanks to the generous, anonymous listener who adopted program host Helen Yost as her KRFP DJ. The Wednesday, July 18, 2018 Climate Justice Forum radio program, produced by regional, climate activist collective Wild Idaho Rising Tide, features news and reflections on renewable energy around the world, activist events across Idaho this week, deadly oil train hazards, a defense bill limiting public input on mining and drilling projects, indigenous and allied protests of Bayou Bridge, Keystone XL, and Trans Mountain pipeline construction, New York state agency rejection of a lakeside, propane storage facility, and tar sands valve turners’ release from prison and climate necessity defense trial. Broadcast for six years on progressive, volunteer, community station KRFP Radio Free Moscow, every Wednesday between 1:30 and 3 pm Pacific time, on-air at 90.3 FM and online, the show describes continent-wide resistance to fossil fuel projects, the root causes of climate change, thanks to the generous, anonymous listener who adopted program host Helen Yost as her KRFP DJ. Since two public hearings in Ponderay and Sandpoint on May 23, and two Second Lake Rail Bridge Discussions in Moscow and Sandpoint during June 2018, the Idaho Department of Lands (IDL) issued a final order on Thursday, June 21, approving Burlington Northern Santa Fe (BNSF) Railway’s encroachment permit application for its proposed Sandpoint Junction Connector project . As explained in WIRT’s initial, draft analysis of the decision, IDL has deferred to antiquated, railroad land grant laws and 1000-plus pro-second bridge, BNSF, form letters . Still requiring Clean Water Act water quality certification from the Idaho Department of Environmental Quality, dredge and fill approval from the U.S. Army Corps of Engineers, and bridge permits from the lead, federal agency, the U.S. Coast Guard, BNSF plans to build two miles of doubled tracks, two temporary, work spans, and three permanent, parallel bridges west of existing rail infrastructure across Lake Pend Oreille, Sand Creek, Bridge Street, and downtown Sandpoint. Grassroots, #No2ndBridge, and Wild Idaho Rising Tide (WIRT) activists are concerned about this near-conclusion of the state permitting process, and believe that our community should protect Lake Pend Oreille from this Northwest fossil fuels pipeline-on-wheels expansion, by resisting every advance of this proposal. Its construction could drill 1000 piles into train-spewed, lakebed, coal and other deposits in BNSF’s private right-of-way, releasing more pollution into regional, lake and aquifer, drinking water. North Idaho groups and governments with greater capacity and non-profit status to litigate will probably not challenge dismissal by IDL and other state agencies of myriad, local concerns over significant, project impacts. But we intend to dispute this permit through both conservative, Idaho courts and creative, frontline resistance, and are searching for attorney assistance around the IDL permit appeal filing deadline of Friday, July 20 . Please participate in the third-Wednesday, monthly, WIRT, and #No2ndBridge meeting at 7 pm on Wednesday, July 18, at the Gardenia Center, 400 Church Street in Sandpoint. Event hosts invite everyone to bring and share snacks, refreshments, donations, and suggestions and referrals to lawyers who practice in Idaho and could advise or represent us before and after filing pro se in Bonner County district court. We also ask that you print and circulate the accompanying, double-sided, informal #No2ndBridge Petition, and return it, filled with signatures, to WIRT at public events and farmers market outreach tables in Sandpoint and Moscow, on Saturdays throughout the season, where we hope to talk with you and provide printed material about this critical situation. The Wednesday, July 11, 2018 Climate Justice Forum radio program, produced by regional, climate activist collective Wild Idaho Rising Tide, features news and reflections on Stop Oil Trains in Idaho workshops, demonstrations, and outreach, Lake Pend Oreille rail bridge opposition, invasive mussels on railroad maintenance barges, an Eagle community-protective, oil and gas ordinance, protests at Donald Trump’s Great Falls rally, an aerial blockade of Trans Mountain oil tanker traffic, and South Dakota farmer resistance to the Keystone pipeline. Broadcast for six years on progressive, volunteer, community station KRFP Radio Free Moscow, every Wednesday between 1:30 and 3 pm Pacific time, on-air at 90.3 FM and online, the show describes continent-wide resistance to fossil fuel projects, the root causes of climate change, thanks to the generous, anonymous listener who adopted program host Helen Yost as her KRFP DJ. The Wednesday, July 4, 2018 Climate Justice Forum radio program, produced by regional, climate activist collective Wild Idaho Rising Tide, features news and reflections on upcoming Stop Oil Trains in Idaho actions, North American oil train explosions, Montana and Idaho train wrecks, a tar sands derailment into Iowa floodwaters, a leaking, Portland, hazmat rail car, the proposed, Newport, silicon smelter, a Vancouver, B.C., oil tanker blockade, and Minnesota approval of the Line 3 tar sands pipeline. Broadcast for six years on progressive, volunteer, community station KRFP Radio Free Moscow, every Wednesday between 1:30 and 3 pm Pacific time, on-air at 90.3 FM and online, the show describes continent-wide resistance to fossil fuel projects, the root causes of climate change, thanks to the generous, anonymous listener who adopted program host Helen Yost as her KRFP DJ. 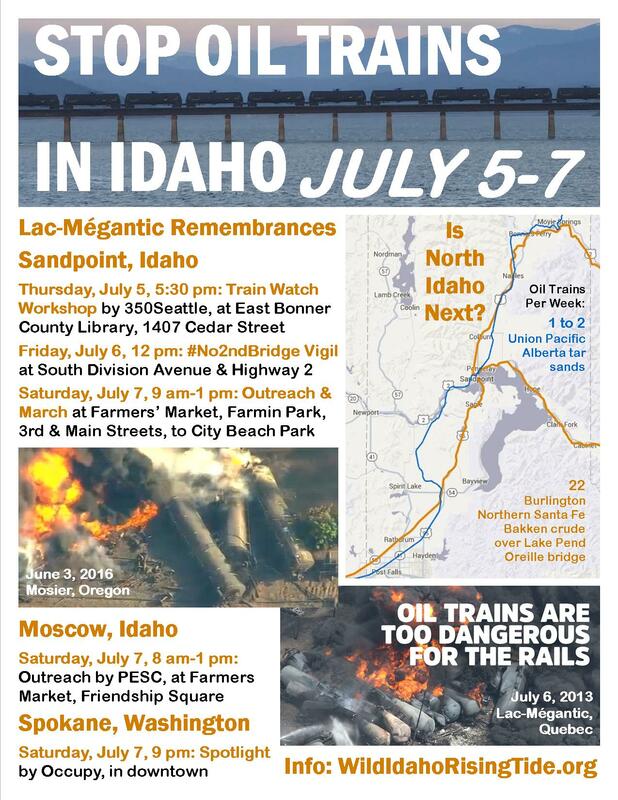 North Idaho and eastern Washington activists invite everyone to participate in five Stop Oil Trains in Idaho events on July 5, 6, and 7, commemorating the 47 lives lost to a Bakken crude oil train derailment, spill, explosion, and fire in downtown Lac-Mégantic, Quebec, on Saturday night, July 6, 2013. During the five years since this tragedy, dozens of similar accidents have wrecked public and environmental health and safety and the global climate – more than in the previous four decades – including the Union Pacific oil train disaster in the Columbia River Gorge town of Mosier, Oregon, on June 3, 2016. In response, Wild Idaho Rising Tide (WIRT), 350Seattle, Occupy, Palouse Environmental Sustainability Coalition, and allied Moscow, Sandpoint, and Spokane partner groups have participated with thousands of people around North America in Stop Oil Trains actions [1-4]. Through multiple training, protest, and outreach events, concerned citizens continue to actively oppose and call for an end to all Alberta tar sands and Bakken shale oil exploitation and train and pipeline transportation, refusing to let Big Oil threaten and risk our families, friends, homes, businesses, lands, waters, and air. Together with environmental and social justice activists across the U.S. and Canada, we are organizing various tactics and resources to stage powerful, effective actions defending and protecting frontline, rail corridor communities and the global climate.